Stephanie Kono, of Punahou, teed off on the 11th hole of the state girls golf championships at Turtle Bay. All she wanted on the dreaded back nine of the George Fazio course was to break even. Instead, Punahou sophomore Stephanie Kono went 6 under on the back side en route to a record-breaking, 8-under-par 64 yesterday in the opening round of the David S. Ishii Foundation/HHSAA Girls Golf Championships. Kono's performance at the Turtle Bay Resort broke the course mark of 65 by former Waiakea golfer Kimberly Kim. Just a week ago, the PGA Junior Golf champion struggled at the same course, going 5 over on that nightmarish back nine. This time, with the course shaved and rolled to utter flatness, nearly every ball challenged the Kamehameha Highway speed limits. That was bad news for most of the field, but for Kono, a veteran of faster surfaces on courses across the country, the opportunities were golden. "Everything was working my way. I hit the ball really well. I putted well," she said of her four birdies on the closing nine. She also eagled the 17th hole. "Every time I'd miss the green, I'd chip it close," she said. In fact, she landed in bunkers twice and managed to chip within 1 foot on each ensuing shot. The record was set with middle tees, the distance format used for men's tournaments, tournament officials said. Kono entered the first round hoping to break even on the back and card a 2-under on the front. Starting her round at the 10th hole, she wound up with an eye-popping 30 and a 34 on the front. 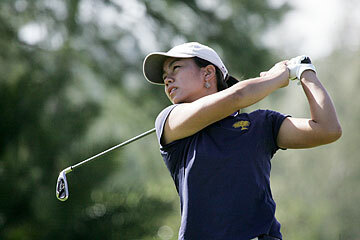 Her nearest competitor was Leilehua senior Britney Choy, who posted a 2-under 70, despite a career-high seven birdies. Moanalua freshman Kristina Merkle, who won the recent Jennie K. tournament, was third at 71. The team leader going into today's final round is Punahou, with a score of 224. Moanalua is one stroke back, with Kamehameha and Mid-Pacific tied for third way back at 247. Kono, though, was clearly the highlight on a windy, blazing-hot morning in Kahuku. The paspalum-grass surface on the greens was no deterrent for Kono. Britney Choy had a career-high seven birdies yesterday. "Both sides were rolled, and we'll roll again tomorrow," director of golf Matt Hall promised. "It'll be quicker and firmer." Several golfers complained about the fast surface, including Choy, who hasn't played in quite as many mainland tournaments as Kono. "I was actually making lots of putts on the back nine. I hit six greens," said Choy, who turned them into five birdies. But Choy bogeyed the 18th before making the trek to the front side and its flattened Bermuda-grass turf. "It was super fast. I was expecting that, but my putter didn't," she said. Choy, who carded a 34 on the back, managed a 36 on the front. Kono was in a zone at the turn and birdied the first hole, but gave it back with a bogey at No. 3. She parred the fourth and birdied the fifth, regaining momentum and confidence. By then, the possibility of breaking her own personal best was at the forefront of her mind. The possibility of even quicker greens in round two has Kono grinning. "If they cut (the grass) again, that'll be better. The ball will roll faster," she said. In addition to the course record, Kono broke the HHSAA state-tournament mark previously held by Merynn Ito of Aiea, who carded a 68 at the Princeville Makai course in 2000. Kono will close in on the tourney record of 140 set by Kira-Ann Murashige of Hilo in 2003 at the Waikoloa Beach Course. Those kind of records, though, are not the primary goal for the defending state champion. "It's never over. Anything can happen. If you look at the U.S. opens and stuff, anything can happen," she said. Choy wouldn't count herself out, either, noting the comeback of the tourney's namesake. David Ishii rallied from six down to win the Mid-Pacific Open just two weeks ago. "Stephanie broke the course record, so that's good," Choy said. "Hopefully, I can catch her tomorrow."